As the People's Democratic Party [PDP] battle against what appears a never ending amount of hurdles thrown in its path by its members seeking the gubernatorial ticket in Anambra -the one-time gubernatorial ticket holder [in 2007] in the person of Nnamdi Uba upped the steaks by handing the PDP a do-or-die ultimatum. Ukpakareports.com gathered through a source within the PDP national working committee that following the Appeal Court pronouncement ordering the Independent National Electoral Commission [INEC] to stay action on the recognition of the PDP's choice to fly the party's ticket in Anambra State, Nnamdi Uba seized the opportunity to hand the Chairman of the party an ultimatum insisting the party has a final opportunity to hand him the ticket instead of its choice of Prof. Charles Chukwuma Soludo. Nnamdi Uba, as gathered, has tirelessly lobbied behind the cover of a veil within the PDP for the party bigwigs to give him an uncontested ticket to allow him contest for the position of governor in Anambra. But Soludo's emergence saw the end to the Nnamdi Uba's tussle. That notwithstanding, Nnamdi Uba and his influence within the party upped the ante. Sources point to the numerous lawsuits against PDP's adoption of Soludo as having been encouraged directly and indirectly by his operators. And that the legal manipulations in the courts will continue until the PDP throws its hands up in exhaustion and withdraw its choice of Soludo and adopt another candidate. 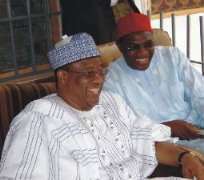 Ukpakareports.com learnt that the ultimatum came as Nnamdi Uba concluded plans to announce his emergence out of the Labor Party on Monday December 7, 2009. This is as even more credible but unverified information indicate that Nnamdi Uba has moved from his choice of Labor Party due to problems that arose due to the unwillingness for the Anambra flag bearer to relinquish the gubernatorial ticket to Nnamdi Uba. Mike Areh, who currently holds the gubernatorial ticket under Labor Party is reported to be a Peter Obi's man and has as a result refused to step away for Nnamdi Uba. Through this effect, Nnamdi Uba has pitched his tent with a friendlier party to the PDP – the Congress for Democratic Change [CDC]. A source, who spoke to Ukpakareports.com on the eve of the Court of Appeal pronouncement against the Soludo campaign, revealed that the CDC will field candidates for every elected position in the 2011 except for the position of the presidency. The source explained that the CDC to be an off-shoot of the PDP. And that it is considered a friendly party to the PDP. The source reveals that the CDC is scheduled to kick off its 2011 campaign simultaneously with the Presidential campaign under the PDP. And it is on this strength that Nnamdi Uba opted for the CDC so as to maintain his supposed stewardship to the PDP – as a loyal party man. In Nnamdi Uba's calculus, the litany of hurdles hurled towards the PDP's choice of Soludo will eventually result in the PDP not representing a candidate against the electoral competition in February 6th 2010 in Anambra. With Soludo and PDP out of the way, Nnamdi Uba hopes to win the race comfortably under the CDC with assistance from the INEC and what is left of his political structure. Upon victory, Nnamdi Uba plans to return to the PDP. In a related development, the campaign train in Anambra appears on the move. This is as the gubernatorial Progressive Peoples Alliance [PPA] in the person of Hon. Uche Ekwunife has selected a running mate to deputize her. She is expected to make the decision public on Tuesday December 8th 2009. Sources in the know of the permutations within Abuja cite Hon. Uche Ekwunife's candidacy in the race as a dark horse. They note that while the other major candidates prep to begin their campaigns, Hon. Uche Ekwunife has completed a tour of 326 wards in Anambra State and has completed a visit of 105 communities out of the 177 communities in Anambra State. That notwithstanding, Hon. Uche Ekwunife's candidacy leaves some sensitive questions unanswered – of which Ukpakareports.com promises to publish in due time. Meanwhile, Nnamdi Uba is expected to announce his candidacy tomorrow being Monday December 7th 2009.